Are your Sims hungry? They won't be for long! 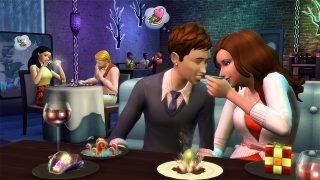 The Sims 4 Dine Out Game Pack* is, well, packed with stuff to do. So let's crack open the menu and tell you what you can look forward to. Experimental Food: We had a field day with a large amount of thrilling, gorgeous, innovative dishes in the game pack. There's stuff that you’ve never seen before in a The Sims game. They’re photo worthy, which is why your Sims will take pictures and hang them on their walls. Complete the Experimental Food collection if you want to prove you’re a true foodie. Learn more about Experimental Food here. Varied Dining Experience. The dining experience is full of new experiences for your Sims. It’s the perfect place to bring a date or celebrate a birthday. There are new activities for the kids, and the casual Sim-watching experience at the restaurant is better than almost anywhere else in the world. Your Sims will also gain powerful and interesting Moodlets. Simply put, taking the family out to eat is a blast. Customizable Restaurants: Restaurants are customizable from start to finish. You can choose the name, the menu, how the staff dresses, how customers dress, and what the restaurant looks like. We left no stone unturned on the customization front so you can dig in to the starchy bits and customize to your (artichoke) hearts’ content. Read more about restaurant customization here. 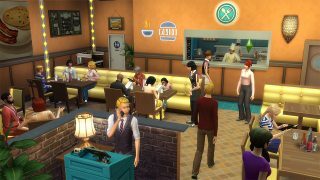 Ownable Restaurants: Your Sims can throw off their uniform and replace it with a toque (look it up!) to start their own restaurant. If you’ve played The Sims 4 Get to Work*, you have an idea of how it works. Your Sims can hire, train, and inspire staff, compensate customers for bad service, customize the menu, and more to enjoy a rich, full flavored entrepreneur experience. We cannot wait to read about your restauranteur stories. New Objects. Keep outdoor diners cozy beneath the new Warming Lamp, or complete your seafood restaurant with the beautiful new aquariums. Customize your own signs for your restaurant and plop down booths for snug, intimate dining. Don’t get us started on the decorative objects! You’ll have so much décor to sink your teeth into. Pre-Made Restaurants. 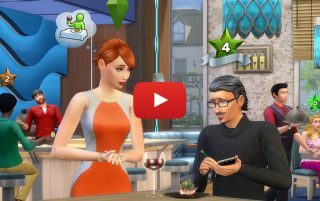 If you aren’t a builder, or want to see some examples before creating your own, try one of the six pre-made Restaurants located in your Library. Seafood, high-end Italian, diners, and date-night restaurants are all here. Bring the Food Home. 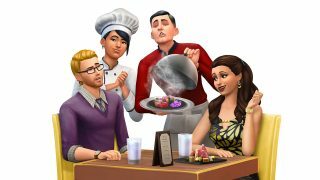 If your Sims love to cook, and they love the new food they tried at the restaurant, they can try their hand at cooking it themselves. If you purchase a Chef Station for your home, you can set your Sims to work. Wow home dinner guests with new experimental foods like the Glazed Heirloom Bamboo Roll and Sizzled Brisket over Sour Clover Salad! We cannot wait to share more with you about The Sims 4 Dine Out. It releases on June 7 and you’re going to love it. Tuck your napkin into your collar, because it’s almost time to eat!